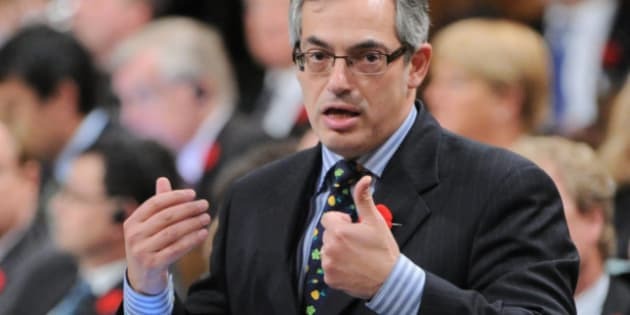 OTTAWA - The NDP has obtained more documents which appear to contradict Tony Clement's insistence that he was not involved in carving up a $50-million fund to spruce up his riding before last year's G8 summit. The Treasury Board president told a Commons committee he simply played a "co-ordinating role," forwarding the wish lists of mayors in his Ontario cottage country riding to John Baird, infrastructure minister at the time, who decided which projects would get funding. He repeated that assertion Wednesday in the House of Commons. But municipal documents obtained by the NDP through provincial freedom-of-information legislation tell a different story. New Democrat MP Charlie Angus says they show Clement gave "false and misleading" testimony to the public accounts committee earlier this month and is not fit to be in cabinet, much less in charge of the nation's treasury. "Mr. Clement has become toxic, dead weight to this government," Angus told a news conference Wednesday. "He has burnt his bridges of credibility, he has misrepresented the facts, he can't even stand up in the House and answer a question because he knows it puts him deeper in the doo-doo." The documents show it was the manager of Clement's Parry Sound-Muskoka constituency office who put out a call to municipalities for funding applications, specifying the kinds of projects that were wanted. "I have been asked to put out a call for G8 submissions specific to the enhancement of the downtown area's (sic) in each town and municipality," Sondra Read wrote in a March 30, 2009, email to nine mayors and other municipal officials. "We are looking for storefront renovations, roadwork, landscaping and general beautification, lighting, signage, anything that will enhance and is specific to the downtown area." Read advised the municipalities to send their applications to her and she would forward them to FedNor, the economic development agency for northern Ontario over which Clement, then the industry minister, presided. The email appears to be at odds with Clement's testimony at the public accounts committee. Clement vehemently denied opposition accusations that he and his officials were involved in selecting the 32 projects which ultimately received almost $45 million. "That's just a myth," he told the committee. "It never happened that way. We were not involved in selecting these projects." Read's reference to FedNor also appears to contradict Clement's assertion that no government department or agency, other than Baird's infrastructure department, was involved in the selection process. The minutes of a Feb. 27, 2009, meeting with local officials also appears to contradict that assertion. The minutes show that FedNor official Tom Dodds advised that "FedNor is going to evaluate all projects applying basic tourism principles and provide a recommendation in a report for Mar. 30." In her last report in June, former auditor general Sheila Fraser slammed the government for an unprecedented lack of any documentation to explain how G8 legacy projects were chosen. She said other departments and agencies insisted they were not involved and, therefore, could not provide any paper trail. The report also slammed the government for misleading Parliament when it sought authorization for an $83-million border infrastructure fund, without mentioning most of the money would be spent on G8 legacy projects far from the border in Clement's riding. The RCMP has decided not to investigate opposition allegations that the Harper government misappropriated funds in creating the legacy fund. Clement told the public accounts committee that his mayors initially came up with 242 projects worth about $500 million. When he advised them they'd have to whittle their wish lists down to only priority projects, Clement said the mayors came back with applications for 33 projects, which were passed on "without additional alteration or review" to Infrastructure Canada. Baird, now foreign affairs minister, ultimately approved 32 projects. Clement said the 33rd was withdrawn because "the local municipality decided" it couldn't afford its share of the cost. Liberal MP Gerry Byrne expressed incredulity that the mayors "self-evaluated" their competing wish lists and pared them down "with surgical precision" to those projects which were cleared for funding. But Clement rejected Byrne's suggestion he was the "guiding hand" behind the choices. Here again, the new documents obtained by the NDP appear to contradict Clement. In an April 20, 2009, email to Read, the chief administrative officer of Gravenhurst, Ont. provides an updated list of projects, including notification that the town — on Clement's recommendation — is withdrawing its application to fund construction of a centennial centre. "Minister Clement has advised that this project should be removed from the G8 project list and be included in the Town of Gravenhurst's application for the Building Canada Fund (a national infrastructure fund) — on the advice of Minister Clement, please remove this project from the G8 project list." The documents also show that a staffer in Clement's ministerial office, David Pierce, advised the Township of Muskoka Lakes that two of its proposed projects would not receive funding due to the fact the legacy fund's limited budget was insufficient to cover all the 200-plus proposals initially received. And he made it clear that funding decisions were being made by Clement's office and Industry Department officials — not Baird's infrastructure team. "The minister's staff and departmental officials have reviewed all proposals received in accordance with the above considerations," Pierce wrote "on behalf of Minister Clement" in a July 2009 letter to the township's chief administrative officer. "We have determined that the focus and priority of federal support for community based, G8 Summit-related projects will include promotional activities for the area, infrastructure and legacy projects." The documents show that municipalities certainly believed Clement had the final word on which projects would receive funding. Muskoka Lakes township, for instance, submitted its wish list to Clement "for your consideration and approval." However, Clement persisted Wednesday in denying any role in selecting the projects. "The record is very clear ... that I had no determinative role. I had a recommendation role as a local member of Parliament but the decisions were made by the minister of transportation and infrastructure," he told the Commons. That Clement answered for himself was, in itself, remarkable. For months, Clement has sat firmly in his seat while Baird fields all questions about the legacy fund in the Commons. While Clement did take questions —75, by his count — at committee, Baird was also there to back him up. The NDP also accused Clement of altering the official record of his testimony to the public accounts committee — an accusation Clement vehemently dismissed as "absolutely false." Angus said the initial written transcript and audio and video recordings of the proceedings show Clement twice saying "sure" when asked by Angus to table the 242 initial applications for G8 legacy funding. Yet in the official Hansard transcript, Clement's "sures" have mysteriously disappeared. MPs and their staff can ask for corrections or amendments to the transcript before the final, official version is issued. "The president of the Treasury Board is the one who has to ensure that everyone follows the rules. Here's a guy who's broken all the rules and they're running behind him trying to change the story every week as more information comes out," Angus charged. Clement did not directly respond when asked in the Commons about the altered transcript. Nor did he re-offer to produce the application forms. However, he later asked the Speaker to investigate how the official record of the committee came to be altered. He said neither he nor anyone in his employ asked for the changes and called the NDP's assertion to contrary "baseless and outrageous." The NDP has dug up a treasure trove of municipal documents through provincial freedom-of-information legislation, much of which has been embarrassing to Clement. But the latest batch —part of 1,000 pages the NDP is still poring over — may be the most damaging yet.